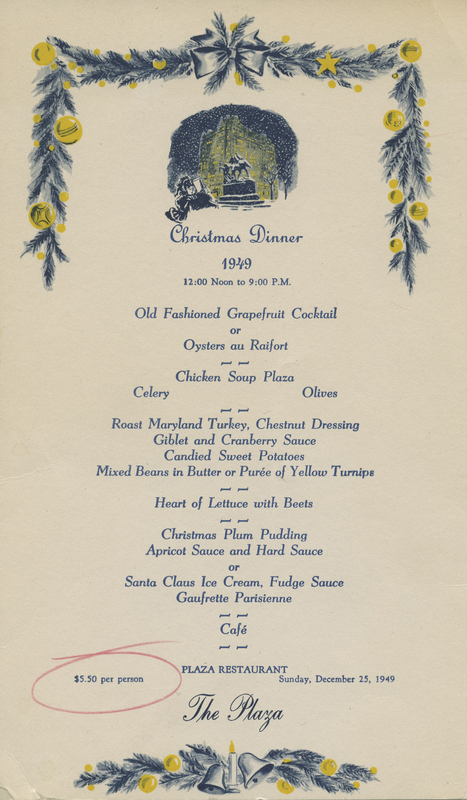 Hyde Park, NY – Just in time for the holidays, The Culinary Institute of America has opened its extensive archives to share vintage menus for Christmas and New Year celebrations. The online exhibit presents a selection of historical holiday menus from the CIA's Menu Collection housed within the Conrad N. Hilton Library at the Hyde Park, NY campus. Each menu reflects the way people celebrated holidays in the past; encouraging diners to eat, drink, and be merry. The design of each menu was often exquisitely illustrated, reflecting the celebratory nature of the holiday. While the food selections themselves are notable from a historic perspective, the actual art featured on the menu is enough to captivate the true history lover. The menus include many familiar offerings like plum pudding, but also other more unusual items like pickled walnuts which may surprise. The Plaza, New York City, December 25, 1949: This Christmas dinner menu for The Plaza Restaurant in 1949 is printed on a single sheet decorated with blue garland and bells, and yellow ornaments. The prix fixe menu included grapefruit cocktail or oysters au raifort, chicken soup Plaza, roast Maryland turkey with chestnut dressing, and Christmas plum pudding or Santa Claus ice cream with fudge sauce and gaufrette Parisienne. Restaurant Maire, Paris, France, 1909: The popular restaurant was located at the corner of the Boulevards Saint-Denis and Strasbourg and was known for its wine, entertainment, and food. 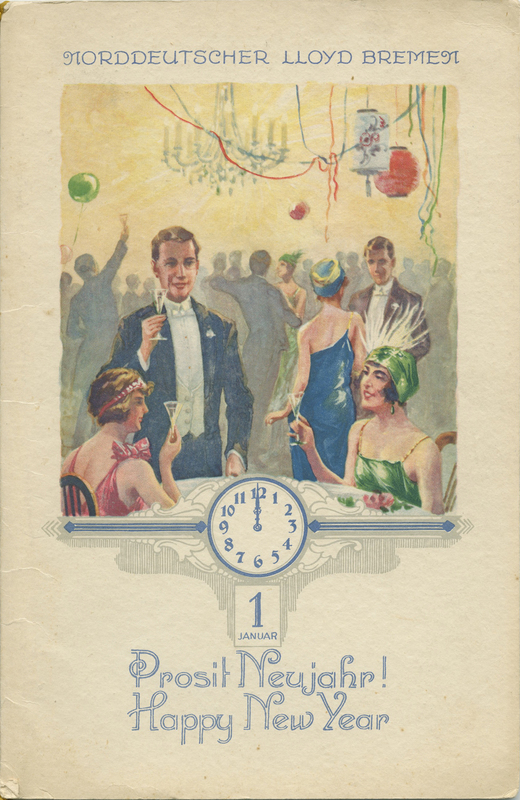 The menu for this New Year's Eve celebration featured Huîtres de Burnham, Consommé de Volaille en Tasse, Còtelette d'Agneau, Volaille Truffée ou Pâté Fois Gras, Salade Russe, Mandarines de Nice Glacées, Friandises, and Corbeilles de Fruits. 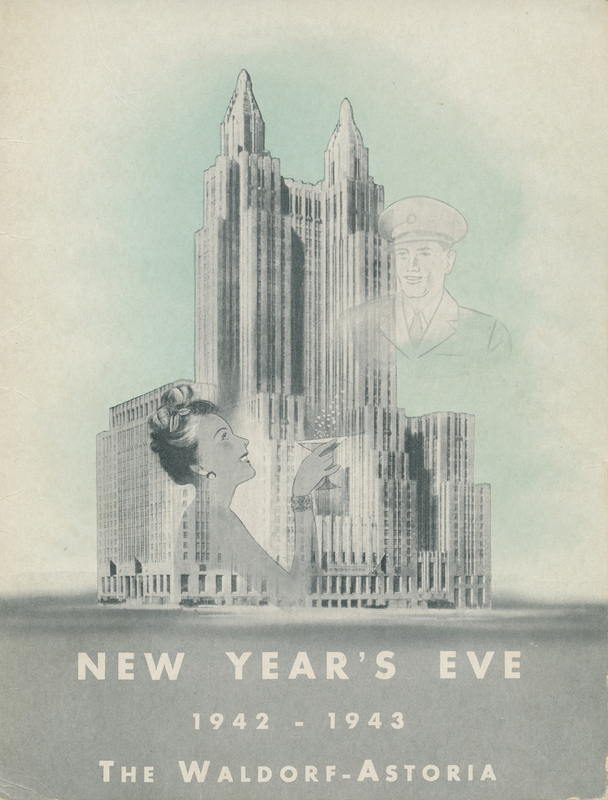 Waldorf-Astoria, New York City, December 31, 1942: The cover of this New Year's Eve menu reflects the mood in the country during World War II. Superimposed over an image of the grand Waldorf-Astoria hotel is a woman who looks up and raises a glass of sparkling champagne to a uniformed officer who is also superimposed above the hotel and blue sky. Amongst their choices that evening on the fixed price menu were smoked Virginia ham with Waldorf salad, or scrambled eggs and country-style bacon. The Culinary Institute of America's special collection of 30,000 menus includes menus from CIA restaurants, along with gifts from major menu collectors, including George Lang, Chapman S. Root, Vinnie Oakes, Roy Andries de Groot, and the Smiley family of Mohonk Mountain House. Assembled over decades, the collection illustrates the history of dining in America and abroad, with menus from all of the states and more than 100 countries, as well as ships, railroads, and airlines. Anyone interested in learning more about the collection or locating specific menus should contact the staff at library@culinary.edu.